Oh, great. Now you're going to put it on hold and I won't be able to renew it. Yeah, we're having a lot of fun with it. And Daisy legit beat me the first time we played, which always boosts her enthusiasm for a new game. The games says 2 players expandable to four with another copy of the base set but I haven't yet figured out why you couldn't play four with the base set other than they only give you two "threat meters" -- which could very easily be tracked on paper. I'll probably give it a few more tries, but I'm hard pressed to think that there won't be a time where I would just rather play Legendary--more variations and diversity. Keep in mind that this is a Living Card Game, with (as of now) over 50 expansions. They want you to buy more stuff, including more Core Sets. And, as someone who owns most of those expansions, it's very much a deckbuilder. Certain "types" of decks have different strategies, but that's stuff that's not really evident in the core set or its encounters. The rules in the core set are trash (FFG recently released a completely new version that has much, much better rules, from what I've seen), and the game is more of lifestyle choice than one-and-done deckbuilder. If you just want a single game box to play on occasion, Legendary is probably the better choice. But--looking at the whole expanse of what's been released for both games--the amount of diversity in quests, cards, and options in the whole of LotR blows Legendary out of the water. 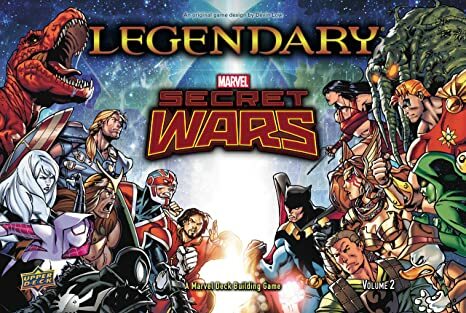 Oh, and I should add—I think Legendary is a really good game (especially the Encounters version of the system), but the nuance of LotR, which really starts becoming clear with the third big-box expansion and its connected quests--is right up my gaming alley. EDITED: Also, the game does have a tableau-building aspect—you're playing cards that (hopefully) stay on the table for a bit—but deckbuilding is a huge focus. If you're just playing with the Core Set, you're probably not seeing this; there are barely enough cards in the Core Set to make a "real" deck (at 50 player cards), let alone a good one. Once you begin adding more cards to the card pool, card draw and deck fishing become more and more important. Cindy and I got this as an x-mas gift, and despite us being pretty good at Legendary, even on harder levels, we lost like our first six games or something. I think the Masterminds and schemes are on the hard side while the heroes are a bit weaker. (In one game we both had the 4-2 agent/trooper split to start, and in between charging, scheme twists, and villains ascending, we had five masterminds before drawing a single henchman. It's also a kind of issue for me that I don't *know* these heroes...they are apparently specific to this one story line. Captain Britain? Spider Gwen? Silk? Why are X-Men and Guardians of the Galaxy villians? Why the heck does Howard the Duck have level 7 Kung Fu? I think this will be a lot more fun when it gets mixed in with the other expansions than it is as a stand alone. Wingspan was definitely the “hot” game at this year’s Whose Turn? conference. I liked it but didn’t love it, though I did get stuck in two games with some slowing things down with analysis paralysis. A regular group who knew rules would be faster. 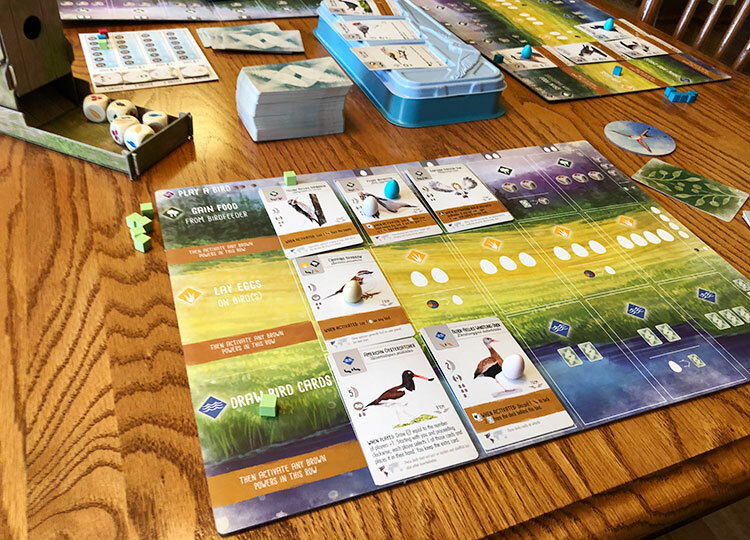 A tiny bit like 7 Wonders but with a bird theme as players compete to place birds in 3 different habitats, feed them, and lay eggs. Bonuses for various combinations and pretty artwork. Probably won’t buy it, but will play it in game group. Also really liked Istanbul Dice game as a quicker, simplified Istanbul. My wife and I finally got our own copy of Agricola for Christmas after having played and enjoyed it with family a few years ago. Also, I played the Call of Cthulhu RPG for the first time this weekend, my brother Aren acting as keeper and introducing me and a couple of friends through the quick-start story, "The Haunting." Fantastic time and I'm hoping we can keep going with that. It also makes me eager to pick up the Arkham Horror board game, which is apparently similar in style and feel. The long Pandemic Legacy Season 2 nightmare is finally over. Suffice to say it concluded with my character's death and a lot of cheers. Soooooooo many actions, hard to keep track or strategize. On a side note, my newest obsession is Burgle Brothers. Like Pandemic (regular) it is fun as a coop game but is superduper fun as a solitaire game on the app.